Cosmetic injectables are an effective way to diminish wrinkles, lines and other signs of aging. Injectables help you achieve a more youthful and vibrant appearance by either blocking the nerve signals to muscles that cause wrinkles or volumizing areas of your face to create smooth skin. At Synergy Medical Aesthetics, we offer a variety of injectable treatments based on your unique goals and characteristics. If you’re tired of living with lines and wrinkles, please call us today at 250-591-1566 or complete the form on this page to learn more about our cosmetic injectables for the face. Our facility in Nanaimo welcomes patients from across Central Vancouver Island. Wrinkles, depleted facial volume and other unwanted signs of aging can affect your self-confidence and in turn, your personal and professional interactions. We proudly offer a variety of cosmetic injectable treatments to sculpt and lift the face, restore lost volume and produce a more youthful and natural appearance without the need for surgery. Every injectable procedure offered at Synergy Medical Aesthetics has been proven to be safe and effective. 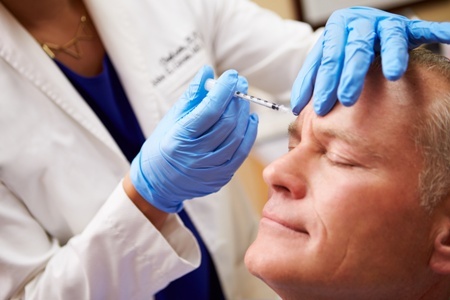 BOTOX® Cosmetic: The cosmetic form of botulinum toxin, BOTOX® Cosmetic blocks nerve impulses, giving your skin a smoother, more rejuvenated appearance by temporarily paralyzing the muscles that cause wrinkles. It can effectively address frown lines, forehead creases and crow’s feet around the eyes. Juvederm: Harnessing the power of hyaluronic acid, a naturally occurring substance, Juvederm can restore your youthful beauty by adding volume to your facial region and smoothing moderate to severe wrinkles. Belkyra: Do you suffer from a double chin? When injected into the fat beneath the chin, Belkyra breaks down the fat cells, and the body responds by metabolizing (i.e., removing) those fat cells. Belkyra contains a substance called deoxycholic acid, which is naturally present in the body as an aid in processing dietary fat. Restylane Skinboosters™: These soft hyaluronic acid injections restore plump, smooth and elastic skin on the hands and face. The injections also correct roughness and poor skin texture. These safe and versatile treatments can address a broad array of aesthetic facial issues, such as wrinkles and fine lines in your skin, volume loss in your cheeks, hollows beneath your eyes, and stubborn fat beneath your chin. To learn which injectable treatment is best suited for your specific goals, it’s important to meet personally with one of our experienced doctors to discuss your options and expectations. If you live in Nanaimo or other part of Central Vancouver Island and would like to learn more about the cosmetic injectable treatments available at Synergy Medical Aesthetics, please call us today at 250-591-1566. Disclaimer: The information throughout this plastic surgery and skin care website is not intended to be taken as medical advice. The information provided by Synergy Medical Aesthetics is intended to provide general information regarding breast augmentation, breast lift, liposuction, tummy tuck, facial plastic surgery, Belkyra, BOTOX, sclerotherapy, facial vein removal, and more for residents of Nanaimo and nearby areas of British Columbia. If you are interested in finding out more, please contact us today for a personal consultation.